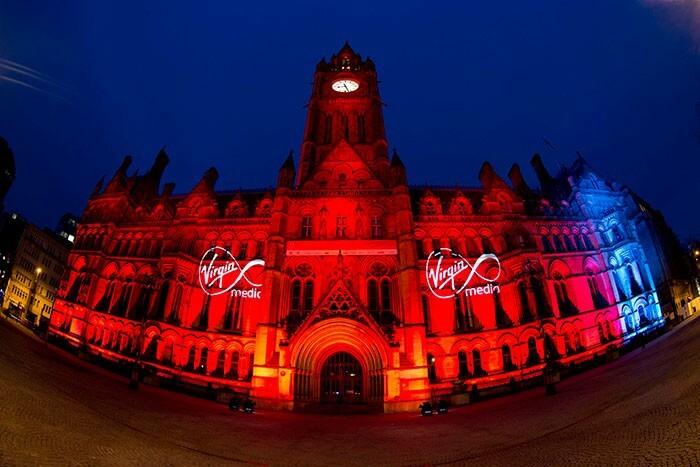 Manchester based lighting and rigging company dbn designed and installed lighting to illuminate Manchester Town Hall for the Virgin Media event No Likey, No Lighty, where football fans tweeted in their support for the outcome of the local derby match between Manchester City and Manchester United. The building was lit proportionately in red (Man U) and blue (Man City) the evening before the match reflecting these results. dbn’s project manager Andy Kennett and his team worked with Roy Fernley of Event Technical Support who coordinated all the technical elements for creative communications agency, Bray Leino. Kennett designed the lighting scheme, for which even coverage was the most important factor as it was essentially a press photo opportunity. He chose 20 Studio Due CityColor floods, 22 SGM Palco LEDWashes, 16 Clay Paky Alpha Beam 700s and two CP 1200 HPE Spots fitted with special Virgin Media gobos, all controlled via a Jands Vista S1 console. dbn has lit the building before, but normally as a backdrop to events staged in the Square in front of the building as opposed to it being the centre of attention itself. To achieve the even coverage, he divided the front fascia of the striking Victorian Neo-Gothic Town Hall into three areas of light. The Palcos covered the lower band, the CityColors took care of the middle while the Alpha Beam 700s highlighted the top of the building and the clock tower in the centre. The CityColors and Palcos were evenly spaced out along the foot of the building, three metres below ground level in the moat, which concealed most of the lightsources. Access down into the moat was unsuitable for equipment so the dbn crew engaged in some inventive rigging using a truss structure and a chain hoist to lower the equipment into the moat safely and efficiently. To save set-up time on the event night, the Alpha Beams and HPEs were securely ratchet strapped into the back of a curtain-sided truck, driven into place and focused during rehearsals the night before. The relevant parking spot was marked up and then the lights were driven away. The truck returned for the event and was parked and powered up bringing everything together in one place to complete the spectacular lighting scheme. Utilising the truck was also part of dbn’s weather-protection contingency, together with choosing the IP rated CityColor and Palco fixtures which stayed in place overnight. The mix of discharge and LED light sources blended very well on the stonework of the building. The CityColors were specified for their brightness and throw capabilities. The Alpha 700s bright narrow beams proved ideal to pick out the top of the building, easily reaching the top of the clock tower which is nearly 275ft high. The lighting design also allowed for specific sections of the surface area to be appropriately coloured according to the percentage results. On Sunday 7th April, Manchester Town Hall was lit 84% in red and 16% in blue reflecting the number of tweets sent by supporters of each team. On Monday 8th April, current Premier League Champions Manchester City won the match 2-1, ending United’s four-and-a-half month unbeaten run at the top of the 2013 Premier League which they are still expected to win comfortably.